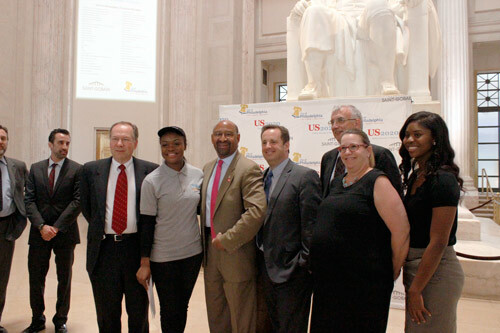 announced that Philadelphia was one of seven U.S. cities to with the US2020 City Competition. With funding from this competition, the Philadelphia US2020 Coalition will develop innovative models for increasing the number of science, technology, engineering and mathematics (STEM) professionals mentoring youth, particularly female, low-income and minority youth in Philadelphia. YouthBuild Philly’s participation in the official announcement emerged from the school’s ongoing “Building Our Future Together” partnership with Saint-Gobain Corporation, a building materials manufacturer headquartered in King of Prussia and a partner in the Philadelphia US2020 Coalition. Saint-Gobain employees have mentored and volunteered alongside YouthBuild students on several occasions. Just in the past year, Saint-Gobain (and subsidiary CertainTeed) employees have led a design charrette to involve students in the planning process of LEED-targeted renovations on Wingohocking Street, helped with the physical deconstruction of the abandoned Wingohocking properties, and mentored Green Construction and Advanced Construction students at a lunch-and-learn designed to help students take full advantage of the International GreenBuild Conference held in Philadelphia in November. What I have learned in the last year is that when you invest in young people – when you support, mentor and guide them – you can change the trajectory of their life. When young people have their eyes opened to experiences and opportunities they never thought were possible – they can dream bigger and their reality can be so much more. That’s why I am so excited about the life changing potential that this funding will have on young people in Philadelphia, whose dreams and imaginations can be opened up to new possibilities. 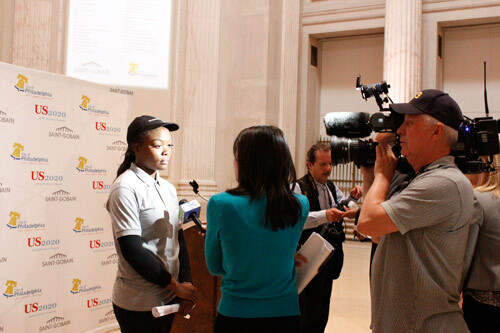 Following the event, Carmen spoke to CBS 3 News and the Philadelphia Tribune, and described further the important role that mentors have played in her getting her life back on track after dropping out. The salutatorian of YouthBuild Philly’s Class of 2014, Carmen is now enrolled in English 101 at the Community College of Philadelphia and a valued employee at a Starbucks store in Center City Philadelphia. Thanks for the lovely comment Nia! We appreciate the support.